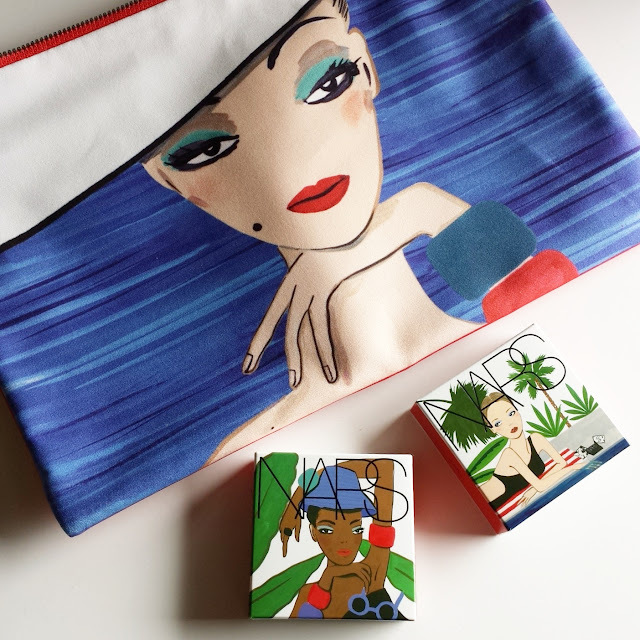 NARS teamed up with Greek illustrator Konstantin Kakanias to make the most gorgeous packaging for their summer 2016 collection. Sadly they used his work only on the outside packaging not on the actual product too. NARS website offered free large pouch with 2 item purchase that had the work of mr Kakanias on it. I was surprised how big it is and how nicely it is done. Since I do not like to keep boxes (even if they are this pretty) I will have nice pouch with the French riviera theme. 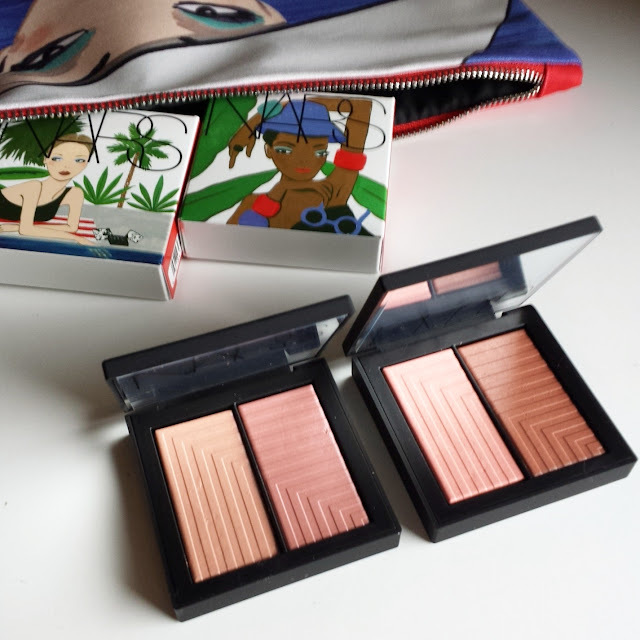 I chose 2 Dual intensity blushes – Liberation and Sexual content. I have never reviewed Dual intensity blush formula before but I wrote about their Dual intensity shadows here . Blush formula is as wonderful as eyeshadow one. But note one thing blushes are definitely not as pigmented as shadows – or maybe it’s more accurate to say they are firmer and pigment is more pressed so it allows you to choose from very sheer application or to easily build the color. I know people either love or hate these. Mostly it’s complaining that they are sheer and do not show up. They have to be applied with firmer, denser brush preferably made of synthetic hair since that picks up more product. You should not be applying these with large fluffy brush because most likely how firmly pigment is pressed you won’t pick up any product. I was on a fence about Liberation worried it might be too dark for my super pale skin (currently I am MAC NC15/NARS Deuville for reference). But it is actually very soft and perfect flush of warm color for summer. I am especially loving lighter peachy pink side with subtle gold sheen to it. I can even wear it alone as lighter blush. So perfect for lighter skin tones! Both shades are intense enough to be worn as a blush. I wanted to wear darker one as a blush and lighter as a highlight but even the lighter one packs so much color on my pale skin that it can be worn by itself. Interesting thing about these two is they combine so nicely! You can use lighter shade from Sexual content combined with darker one from Liberation and lighter shade from Liberation with darker one from Sexual content. They have great staying power and do not settle into pores or lines. They blend easily. Even though it is dry/wet formula I have never tried using them wet – even with dry application they are perfect for me and no need for more intense pigment/application. Honestly I have no complains about these blushes and hopefully will get more colors in future. NARS Dual intensity blushes retail for 45$. I have purchased mine directly from NARS website.